This issue is noteworthy for two reasons. 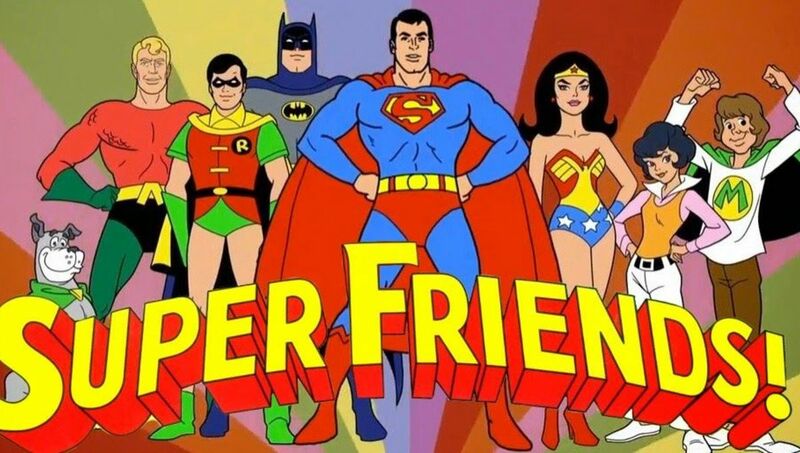 Firstly, it is a 100 page “Super Spectacular”, which DC produced periodically for several of its titles at this time. Secondly, it also marks the end of the Golden Age stories, because from issue 212 on wards we see the return of modern day story lines. 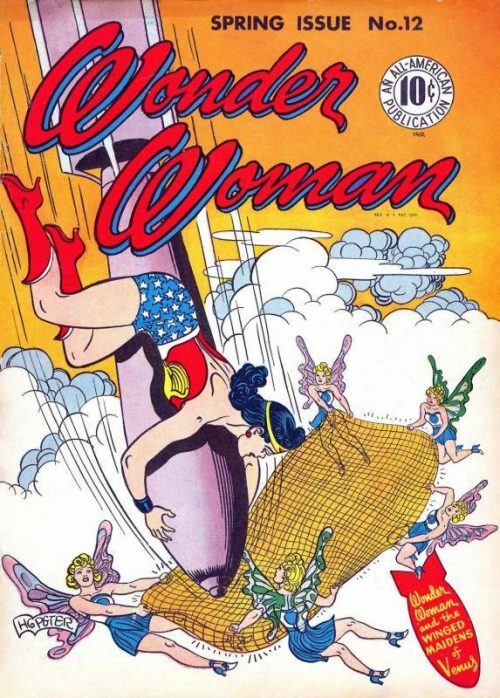 The story begins with Wonder Woman and some other Amazons cruising through the upper atmosphere in the invisible plane, collecting meteor particles. Suddenly, a solar storm erupts and the plane’s controls jam. It begins to gyrate wildly out of control, heading towards the sun and the Amazons cry out in fear. 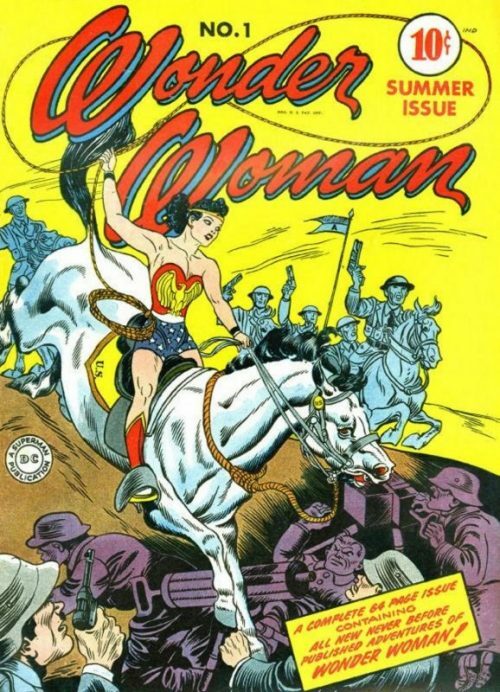 But Wonder Woman does not give up so easily and leaps out of the aircraft, lassoing it with her magic lariat. Using all her strength, she manages to divert the plane into the atmosphere of the nearby planet Mercury. No sooner does she penetrate the atmosphere when she is attacked by flying Mercurians, who use a huge sack to envelop the Amazon Princess and the other Amazons onboard the robot plane. The sack begins to emit an anesthetic gas which causes the Amazon women to lose consciousness. When they later awake they find themselves bound and held in cages suspended from the ceiling of the Mercurian palace. There, King Celerito accuses them of coming to spy on his kingdom. 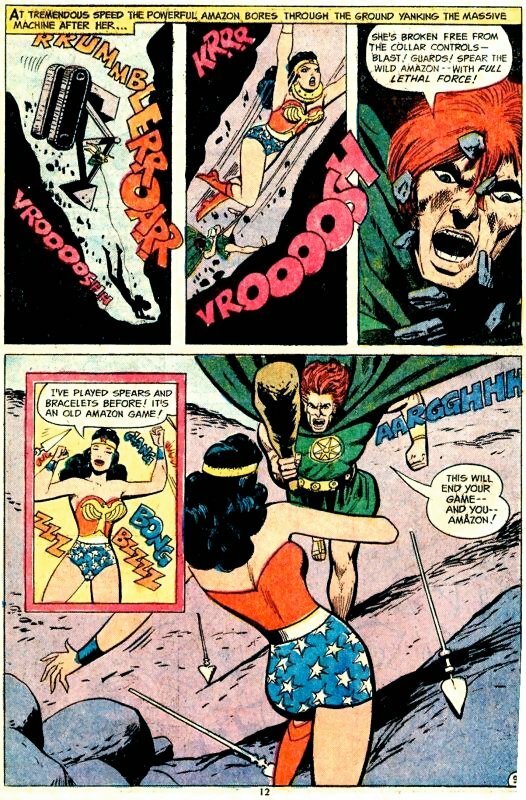 Wonder Woman protests, telling him that he is mistaken and that their plane’s flying instruments were damaged sending them out of control. The king has no time for their explanations however, and tells her that their bonds are made of expanding mercury. If they try to break them they will expand and burn them! 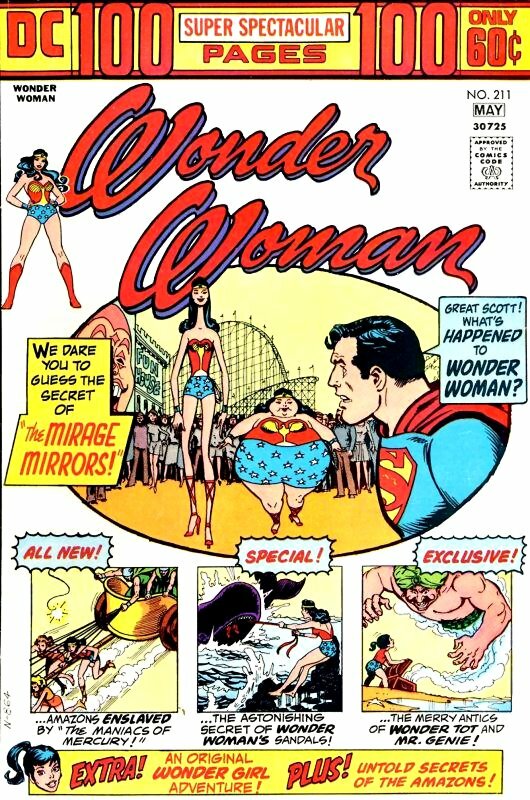 Wonder Woman responds by smashing out of her cage and bowling over the king, while still bound. The King’s cry’s for help alert the guards though, and she and the other Amazons find themselves on the wrong end of electrified spears. The king orders them to surrender or die and the beautiful Amazon Princess realises that they have no choice. The king loosens the Amazon’s bindings around her legs but attaches a neck collar which, at the press of a remote control button, swiftly tightens to kill any disobedient slave. King Celerito instructs the others to be taken away while he decides how to execute them, while Wonder Woman is taken on a tour of the palace where she is shown the activities that other female slaves have to endure. Cleaning rooms down to the last speck of dust; typing endless letters; even being used as human horses to pull Mercurian chariots! When Wonder Woman is finally brought back before the king she muses that the Mercurian men could not always have been so lazy, due to the fact that their bodies are still strong and muscular and their minds are so obviously still keen. He tells her that once both men and women were busy doing constructive work together. At the time, Celerito was the chief scientist and worked day and night to establish contact with other planets. During this time he intercepted a TV broadcast from the planet Earth which depicted men in a show called “The Easy Life”, where the women did all the work. He could not believe what a luxurious life the men of Earth must be leading and so formed a plan. At the next planetary speed contest, he suggested that all the contestants race against each other without their normal winged sandals (which gave them incredible speed) and their winged helmets (which gave them perfect balance). Everyone agreed and removed their sandals and helmets,, but as the race commenced, Celerito hid the women’s’ sandals and helmets. Giving a prearranged signal, he ordered the other men to clap punishment collars around the now helpless women’s’ necks. 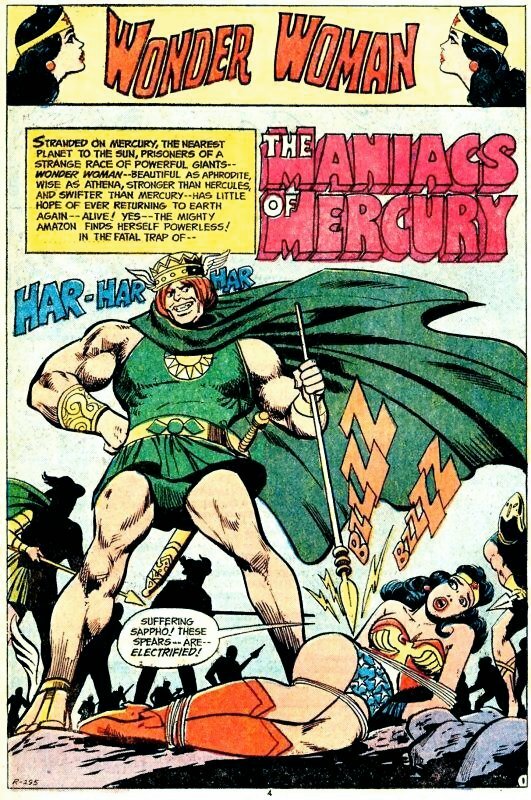 Wonder Woman angrily tells him that his treachery will become a collar around his own neck because he had thrown away the chance to live in peace with the women of Mercury. He replies that she is a fool and that the men have a life of ease now that the women are enslaved – and that now it is her turn! Shortly afterwards, the Amazon Princess is ordered to tow a gigantic excavating machine to a dig site, where she will then help build a temple to the king, the foundations under which her Amazon sisters will be buried! Wonder Woman realises the king is completely mad and does everything she can to slow the work down, even though it means enduring the pain of the electrified spears which the guards use to make her move faster. The driver of the excavating machine begins to lose patience however and activates the collar around her neck, which begins to contract and choke her! Spurred on by her fury, she turns herself into a human drill and frantically digs down into the ground with super speed. She moves so fast that the driver of the excavating machine is caught off guard and he and his excavator topple into the shaft made by the Amazon. At the same time, the collar controls are yanked from his grasp and he alerts the guards above that she is now free of the device. He orders them to spear Wonder Woman using lethal force! As she resurfaces though, she easily deflects the spears with her bracelets and disposes of the guards. The furious king charges at her with a club in his hand but she effortlessly knocks it from his grasp and ensnares him in her magic lasso. She orders him to release all the women and unable to resist the lasso and its powers, he obeys. 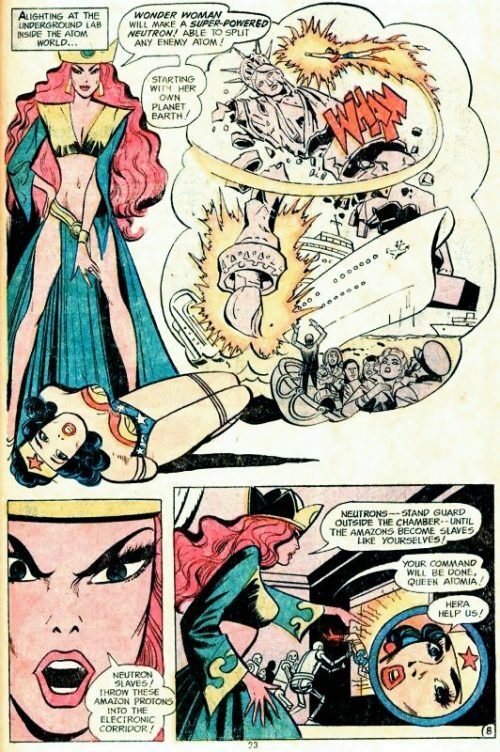 Later, as Wonder Woman and her Amazon sisters prepare to depart, she asks the Mercurian women to live in peace with their men once they have given them a taste of their own medicine of course! This tale begins on a deserted island in the pacific, where an atom bomb has recently been tested. Wonder Woman, wearing a protective suit, is investigating the damage man has caused to the ecological balance of the area. Suddenly, she sees what looks like a miniature sun at the bottom of the crater. Even as she watches, it begins to grow rapidly and she surmises that it must be capturing neutrons from the fragments of the bomb. She attempts to seize the whirling sun but even her strength is not enough to hold on to it and it escapes into the sky! Frantically, she summons her invisible plane and gives chase. However, she soon realises that the sun is on a collision course with a circling observation plane and using her lasso, she manages to yank the large aircraft out of the small sun’s path just in time. As she continues the pursuit, she contacts Paula, the chief scientist on Paradise Island, asking her to activate the Magneto Amazon Skytrap. It immediately draws the tiny sun towards it and soon they have it isolated in a subterranean laboratory on Paradise Island. 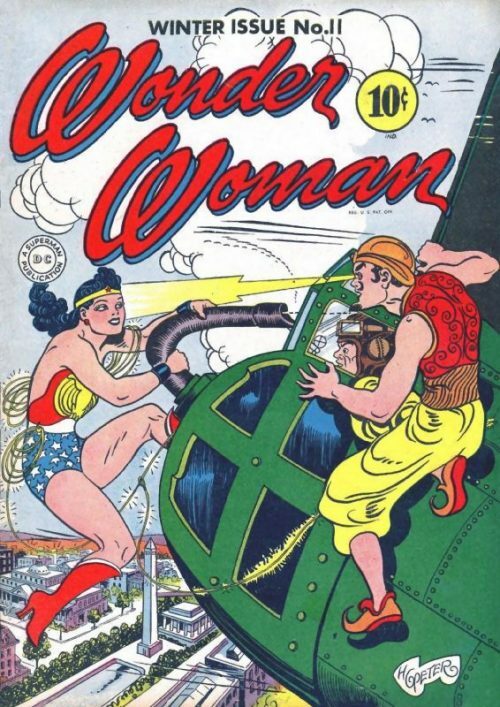 Having landed her plane,Wonder Woman arrives at Paula’s laboratory and asks the Amazon scientist and her assistants to isolate one of the uranium atoms from the sun and place it in the Amazon Mass Spectrometer. Once there, she examines the atom to learn how to control the runaway sun in case it escapes again and does more damage. As she peers through the microscope lens, she marvels at the red protons and the blue neutrons. When she looks closer however, she is shocked to realise that the red protons are, in fact, women and the blue neutrons are robot-like creatures, all existing on the ‘atom planet’. Meanwhile, Queen Atomia of the aforementioned atom women commands her robot slaves to increase the electronic force to allow their planet to escape. She sees that they are near a body of water and she vows that the ‘miserable earthlings’ will suffer for capturing the universe that she had been building. Not even Wonder Woman’s lightning reflexes are prepared for the atom’s sudden leap into a nearby flask of water. Too late, she sees a strange coloured vapour rise up from the liquid and she and the other Amazons in the lab quickly succumb to the Hydroxo gas. As the gas gets thicker and thicker, it begins to shrink the Amazons down to microscopic size. A pleased Queen Atomia orders her robot neutron slaves to use their capto magnets to pull the ‘proton’ Amazons into her kingdom. When Wonder Woman comes to, she finds herself bound before Atomia. The Amazon Princess finds that her powers no longer function in this atomic world! 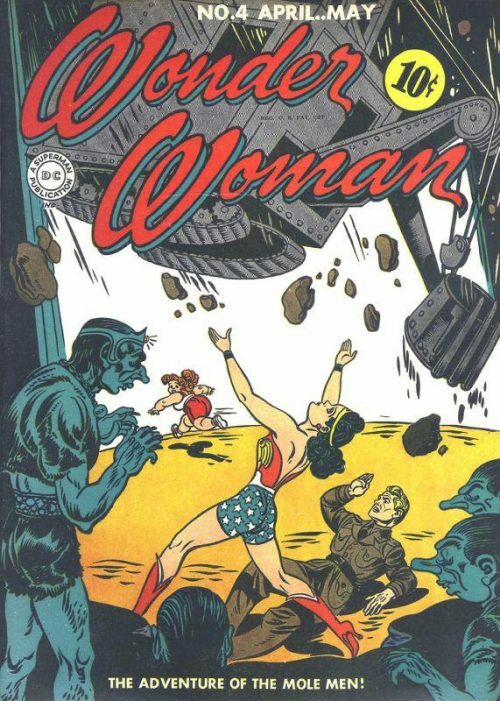 On the queen’s orders, the robots take the helpless Amazons down into an underground laboratory and as they make their way, Wonder Woman asks the queen how she manages to keep the robot slaves from revolting. She replies that because she is the queen, she has the most powerful brain in the atom world. She can project strong vibrations telepathically whenever she gives an order which compels the brainless neutrons to obey. Arriving at the lab, Atomia tells the Amazon Princess that she will make her become a super-powered neutron capable of splitting any enemy atom – starting with her own planet Earth! On the queen’s orders, the robots throw the Amazons into an electronic corridor which will turn them into neutron slaves. Once inside however, Wonder Woman strains every brain cell to send her own telepathic message to the neutron slaves outside. 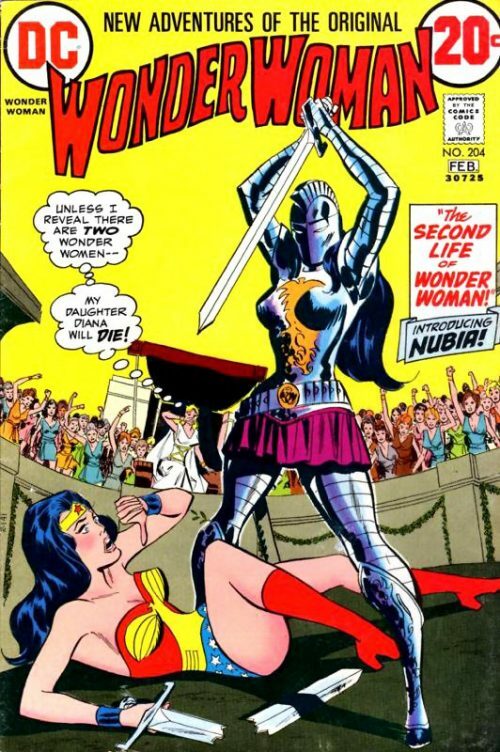 Queen Atomia battles mightily to restrain her robots but Wonder Woman proves to be too strong mentally and orders the robots to free the Amazons. The queen realises that she has been outwitted but vows vengeance on the Earth. Wonder Woman knows there is no time to hunt for the queen and having lassoed her Amazon sisters, she smashes through the centre of the atom world taking them with her. Her sisters cry out in fear as flames leap all around them but Wonder Woman reminds them that they are still protons – not humans. She tells them to breathe in the flames, guessing that the special electric radioactive action will make them normal size again the moment they crash out of the atom. Meanwhile, Queen Hippolyta has entered the Amazon laboratory wondering where everyone has disappeared to. Suddenly, a nearby flask smashes of its own accord and Hippolyta watches in amazement as her daughter and fellow Amazon sisters begin to grow to full size from where the flask had been previously standing. Wonder Woman explains to her mother what had just happened and the queen asks where the atom world was now. Her daughter replies that it had been in the flask of liquid they had just smashed and that it was gone now for good.